This is the June edition for 2017. Ladies, got your handbags ready? I've got you covered with this hand-bag shaped bread. So easy to take your lunch with you don't you think? I chose to bake "Kaak" a lebanese bread with sesame seeds, which I think is similar to the Turkish simit. 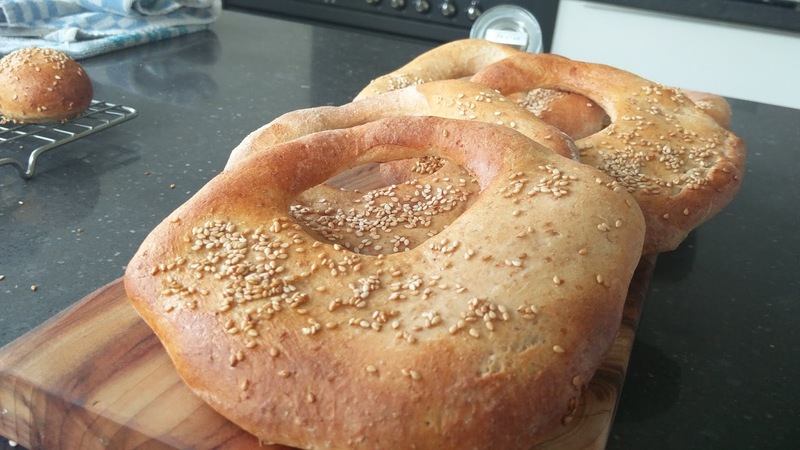 Every time I go into the turkish shop to buy spices (or meat, or dates, olives, herbs... most of the time all of the afore mentioned) I cannot resist buying simit. I've learned to buy one more than needed because I tear into one on my way home. Still I never managed to copy the bread. Since we're gradually edging towards better weather (we are, aren't we?) 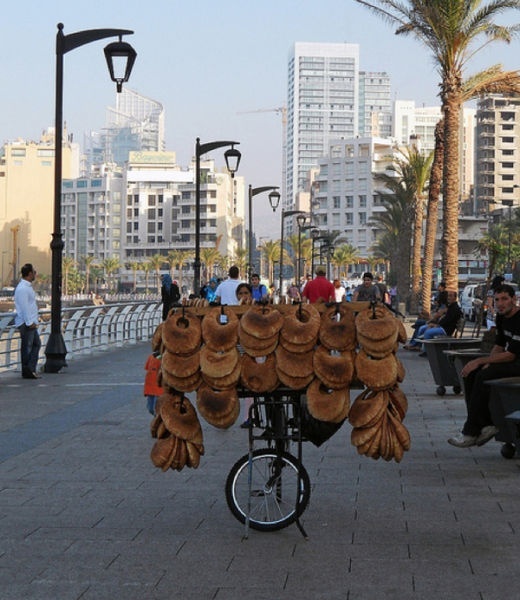 and this particular bread is sold on the streets of Beirut I think this will be a nice one to bump us into outdoor food. As I understand the vendor will create a pocket and the bread is filled on the spot with your choice of za'atar or soft cheese. Cream cheese may work but I'm also thinking of labneh or "hang-op" -> yoghurt strained in cheese cloth and then maybe add herbs to it? Knead: Fairly straight forward dough kneading... This dough will need a normal rise until doubled. I've seen recipes that allow for a second bulk rise after degassing. What you'll be looking for is a malleable non-sticky dough. ** If we are going to follow this recipe, and I just did, we'll be working with a 76% hydration which might be a bit much for the type of dough we're aiming to roll out and keep shape. My dough was very soft and plenty sticky. I used buttermilk instead of milk and had 480 grams of liquid against 625 grams combined flour. So I would suggest keeping some of the water back aiming for around 400 grams or maybe even less. Shape; divide dough in equal parts (aim for 100 gram each) and ball up. Let rest to relax and using a dough pin roll each ball into a circle approx. 18cm / 7" diam., about 1.1/2 cm / 1/2 inch thick. Place the shaped breads on lined baking sheets, be careful not to stretch the dough. Use a large cookie cutter to cut out a circle near the top to form the "handle" and loosely cover to rise another 25-30 minutes. Egg wash the breads, sprinkle with sesame seeds. Well...that didn't go as planned..... So I had this sticky dough and tried rolling it on a floured surface. Didn't work. Lightly oiled is better. Than the mention of a pocket made me think t of pita bread and so I tried rolling it very thin. No way you can make any kind of pocket in my bread!The pita thought was not right. Re-reading the recipe that tells me to roll out to 1.1/2 cm thick. That is not what I did. I rolled paper thin. Ugh. There is beauty in reading a recipe and following through! after baking and eating: Next time I'll keep my disks somewhat thicker. Maybe the balls need to be bigger as well then to achieve the same size. 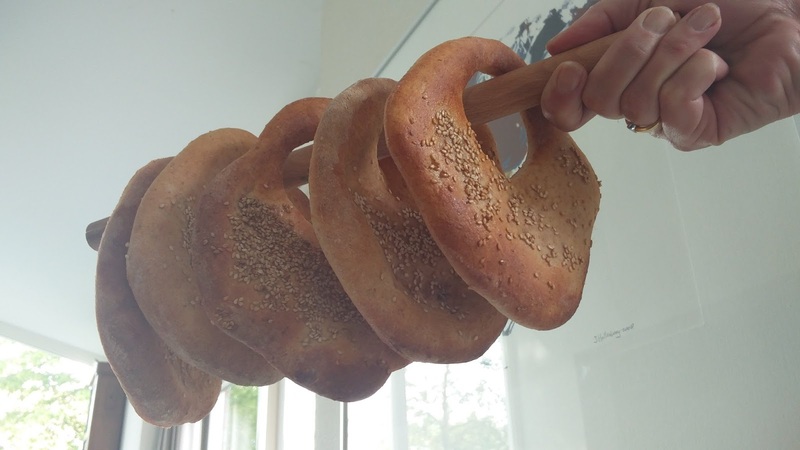 I worked with 100 grams per individual bread.Another thing I did was brushing the bread with a wash of Pekmez, a fruit syrup made from grapes or dates. Mine was pomegranate and I mixed it with a little water, then brushed it on and sprinkled sesame seeds on. This is what they do with the simit. Pomegranate makes it a little sweet/tart I think grape or figs/dates syrup will be somewhat sweeter and better if you like to try it. We loved the breead! Very soft and very airy crumb. Best eaten the same day it's made. We also love for you to bake along with us! It would be great if you could join this challenge, post and let us know how it went. Join us as a Bread Baking Buddy, send your results and what you thought of this to the Kitchen of the Month (that's me) type BBB as subject to bakemyday(at)gmail(dot) com and you'll be send a Bread Baking Buddy Badge that you can add to your blog if you like. Deadline the 29th of June! Wonderful bread Karen! I made them last weekend, so we had them for dinner the same day. I really like them, they all did!... I didn't have time to have a little parade with them pretending to be a handbag as they were eaten very quicky! I've never see this before! Very interesting. Love the photo of the bicycle carrying so many of them. Your notes are great -- I've never made this before but can relate on so many levels. It's so great you guys are doing this after so many years. Impressive! Are you running out of types of bread yet? 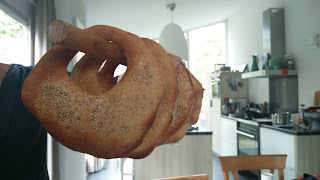 I liked the mini Kaak! Filled, I was full for hours after eating one, I think the large ones could be split over a few people! But so tasty, thanks for choosing this. Well, that was fun!! We'll definitely be making this again, Karen. Many thanks for a terrific recipe (even though, as usual, I didn't exactly follow it to the letter)! Thanks so much for such a fun bread! 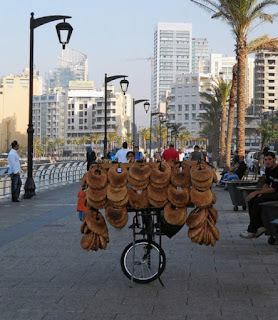 I sent a photo to my Lebanese future daughter in law, and she called it "cart bread." Fantastic choice! This was a totally fun one to bake. As always I read what the other Babes filled theirs with and I need to bake this again to use the new ideas to fill. Great bread. 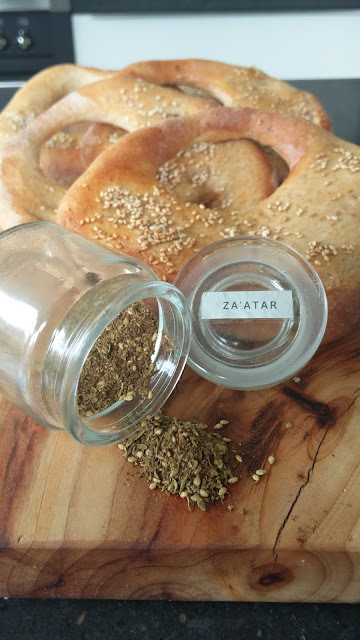 Karen, Thanks so much for choosing Kaak as the bread of the month! It was such a fun bread to make. I love the hanging purses! Tastes great too! 7 - 10 minutes? I love that - especially as we are in the middle of our first summer heat wave. They all look beautiful and perfect for summer! These Kaak look amazing! Fun, yeah, but they look so delicious! And perfect for eating with a summer meal of salad and cheese. 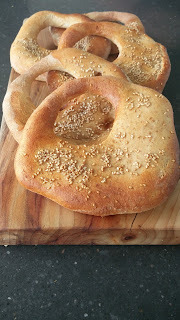 Another great BBB bread I want to make!